May 10 – The Grosbeaks have returned! 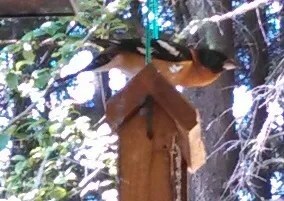 I know that Spring is really here when the Black-Headed Grosbeaks show up at my feeders. This isn’t the best photo, but you get the idea. They’re here to raise their babies, so I’m sure I’ll be getting some better pictures of them.